Compare T-Shirt Quilt Makers - Please. What? We WANT you to compare tshirt quilt makers. Yep. We have found over the years that the more YOU know, the better decisions you make. We have put together a free file for you to download and print. Just make notes about your comparisons when checking with different quilt makers. There are several questions you should be asking ANY COMPANY that you are considering having making your treasured quilt. We have filled in over 10 questions you should be asking before you send your shirts off to make a quilt [or blanket]. First and foremost, you need to decide if you want a quilt or a blanket. Read Difference Between a Quilt and a Blanket for more on that. Wow. What an easy question. Only a month? "Oh, you're my first one", or less than a year. A few years? How about over ten years? Maybe it is a friend or aunt. Do they really want to do this, or are you twisting their arm? Who Is Making Your Quilt? Do you do this full time or part time? Are they working a full time job and working on t-shirt quilts in their 'off' time? That probably means it is going to take 6 weeks or longer to have your quilt completed. Our average turn-around time is 4 weeks. We understand that making and keeping a schedule is vital to getting your quilt done in a reasonable amount of time. We noted on one 'professional' site that expected completion date is almost six months from now. Really? I don't believe they have that many quilts in the queue. Just not focusing on making quilts. Do you have a website? Is there enough info to help you make a decision? Not everyone has a website. Probably if your mom or aunt is making a quilt for you, you aren't needing to check a website. However, for anyone else you might consider, you need to get to know about your quilter. Does the website give you any insight into the person that will be making your quilt? We WANT you to know everything about having a quilt made. We WANT you to have a great experience with us. Maybe you are across the country and scared to mail your shirts to a stranger. We WANT you to have the confidance that we will take care of you and return a quality quilt to you. Houston is a huge area, but over half of our business comes through the mail. How many quilts a year do you make? If less than five, definitely NOT a business, maybe a hobby. 20? Well, that is a couple a month. Still a hobby. Thousands? Probably the cheap and shoddy group you see advertising for $79. These are not quilts, but cheap blankets. (We 'fix' many of these big disappointments every year). We make over 400 high quality t-shirt and memory quilts a year. What do you use for backing fabric? We only use 100% quilt shop quality fabric. We don't use 'solids' as this will highlight the lint and pet hairs that might be lurking in your home. We will use 'your' fabric if you provide it, but for long term use and usability we don't recommend sheets, fleece or minky. Sheets, this is a red flad that the quilt/blanket maker does not stock fabric and will be purchasing 'fabric' as needed when they get an order. Fleece and minky more than likely means that there is not any batting (the middle layer) which makes it a quilt. This is a biggy. This tells you whether this quilt/blanket maker is serious about what they do. Are you meeting them at a quilt shop or a restaurant? That means they either live so far out in the country - OR, they just do this part time. Where do you purchase your fabrics? Wal-mart, Jo-Anns or Hobby Lobby? Not great, they are purchasing lesser quality fabric at retail prices and passing that extra cost to you. Professionals will have accounts set up with fabric distributors. We have accounts with several distributors. We attend Quilt Market (& Festival) every year. We take classes and learn more about what is new and available. We continually add new fabrics and options for you to have that perfect quilt. I know of a couple of quilt makers that where the customer goes to the local quilt shop and the customer is required to purchase their fabrics at full retail ($12 to $15 per yard) then passes the items to the quilter to complete the quilt. Kind of a win-win for everyone but you. What kind of stabilizer do you use? There are a couple of answers to this. Since most t-shirts are made from cotton, we use a 100% WOVEN cotton that adheres to your shirts. They give your tees new life and and will help the quilt become an heirloom that lasts for many lifetimes. None- this means that while they may use three layers that make it a quilt, the shirts are NOT stabilized, and the quilt won't 'last' as long with regular use (and laundry). Polyester, Pellon, Trans-web. Any other generic names. Polyester adhering to cotton does not mix well. Tri-cot - This is acceptable, but is NOT cotton. Stretches one way, but not necessarily the way your t-shirt does. 100% WOVEN Cotton. A little bit of sizing helps us make your quilt. The sizes washes out leaving your shirts and quilt soft and supple (soft & bendable). Industry standard is four to six weeks. There are peak seasons (graduation and Christmas) that can add a little of time to this. BUT, if you are working with a professional company, they have put processes in place that keep to this time-frame. I have heard horror stories of people sending their shirts off and are still waiting for their quilt a year later. So, we have put together a little worksheet for you to make your notes on. PLEASE check other quilt makers. We are glad to have you check us out. No commitments, no obligations. 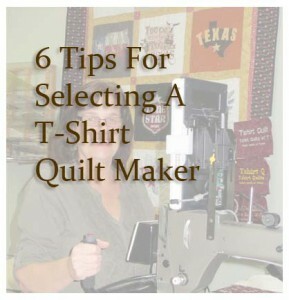 For even more information about having a t-shirt quilt made, download our E-Book T-Shirt Buyers Guide and I will bet you will find your answers. If not, just give us a call or email, and we are happy to help.